Over the years, home renovation services have improved to deliver the best results to consumers at the best possible prices. If you are considering kitchen renovations, for example, your cabinets may be looking worn-down and downright dingy. Instead of paying for custom cabinets or full replacements, you may be able to give your system a rejuvenating facelift. Detail Design & Remodeling is here to serve as Georgia’s home remodeling experts. 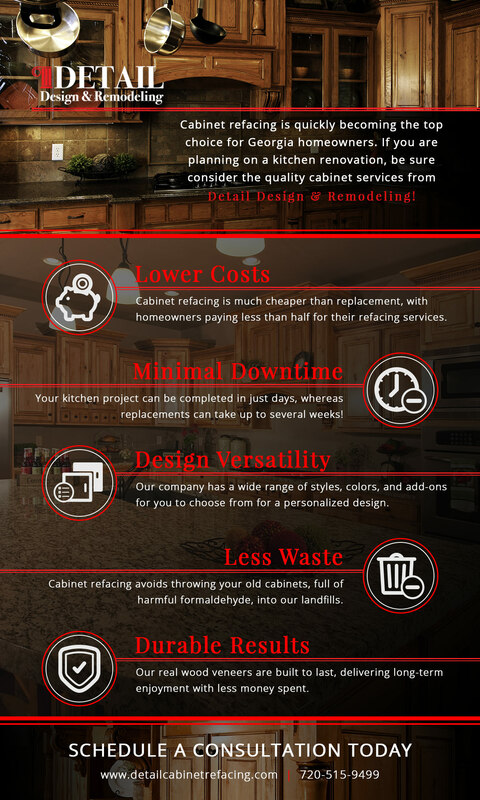 We proudly offer cabinet refacing to Atlanta homes and beyond, delivering durable results that are as effective as they are affordable. If you are wondering why cabinet refacing has become so popular in the best two decades, continue reading here to learn about a few of the biggest advantages our home remodeling contractors can provide for your place. The budget is often the biggest factor in determining the scope and quality of your home renovations. Many homeowners would love to implement beautiful upgrades to their space, but their finances may not be able to cover all of the desired qualities. Our cabinet refacing services save you from paying for a lot of materials and labor. Between paying for new boxes and doors to tearing out the old system, it should be easy to see why homeowners save big when refacing. One of the biggest advantages of our cabinet refinishing and refacing services is how quickly we can get the job done. While complete replacement work can take weeks to finish, our kitchen cabinet refacing services can be finished in mere days. This means you can get your normal routine back on track in short order, avoiding the anxiety and stress often associated with not having a kitchen. Nobody likes to do their dishes in the bathtub, and our services aim to restore your home’s convenience as quickly as possible. Cabinet refacing is more flexible than ever before, supplying homeowners with a wide range of styles and finishes to perfectly match your updated kitchen. Whether you want maple, cherry, or a painted finish for your Georgia home, our home remodeling contractors can work to create a truly optimized result. We also provide the quality hardware to match your updated cabinets, coming in many different styles to give you a choice in your design plan. Being green is more than just a popular choice for many of today’s citizens. We only have one planet, and it’s important that we take care of it for future generations. Kitchen cabinet refacing reduces much of the waste normally associated with cabinet improvements, as your boxes stay in place. Not only does this help to reduce your impact on the planet, it prevents components such as formaldehyde from ending up in landfills. Our team is dedicated to being eco-friendly, and all of our services strive to minimize the waste from your home improvements. Your cabinets are built to last a long time, and our cabinet refacing is designed to do the same! 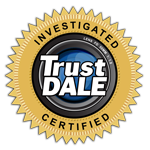 Our contractors strive to create the longest lasting products for each of our customers, focusing on the quality of our work with a fine attention to detail. Other cabinet refacing companies rely on products such as medium-density fiberboard for their doors and drawer fronts, as these materials are much cheaper. We only use real wood veneers, delivering long-term results that you will enjoy for years to come! From cabinet resurfacing to custom cabinet creations, our experienced contractors do it all. If you’re considering cabinet refacing in Georgia or the surrounding areas, we would love to lend a hand. Detail Design & Remodeling is proud to be Georgia’s source for quality home remodeling outcomes, delivering customized solutions to deliver the most value to our customers. Contact us today to learn more!